It’s that time of week again folks! 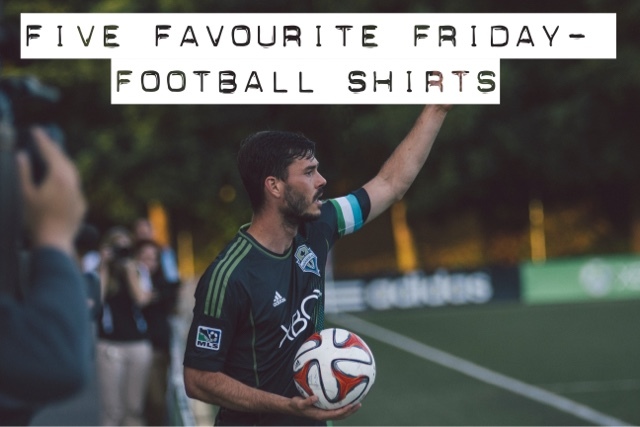 And it’s my turn this week, and I’ve opted for Football Shirts as the topic. I thought I’d opt for something that we’ve not spoken about really. I think we’ve only done one of these on a sport based topic. There aren’t any restrictions, the football shirts can be from any league in the world (including National teams), and from any season! The only thing I would like to clarify is that when I say football, for any Americans that may read this, I mean Soccer. All clear? Fab! Let’s get cracking then! 5. Leonesa, 2014/15 season. This has been noted by many a website as the worst football kit in history. I can see why, but I actually quite like it! I kinda like the idea of looking super smart out on the football pitch! And it’s certainly memorable! 4. Kaizer Chiefs, 2011/12 season. No, I’m not making it up. There really is a team called Kaizer Chiefs (they’re in South Africa) and yes, it is where the band got the inspiration for their name from. I love this kit! I love the combination of black and yellow. It really catches the eye, don’t you think? 3. Cameroon, 2012 It’s just beautiful. All the detail, the lions face… I don’t really need to say anymore! 2. Arsenal, 2007/08 season. I’m not a fan of white kits but this one was a thing of beauty. I loved the detail put onto it. Gorgeous. 1. Team GB, 2012 Olympics. Being totally patriotic here but I really loved Team GB’s kit for the London 2012 Olympics. I loved the off centre Union Flag, I loved that it was all blue, I loved everything about it. And that pattern was used for every sport in the Olympics and it was so nice to see on the different athletes. This shirt was used to mark Arsenal’s last ever season at Highbury before moving to the Emirates Stadium. With Arsenal being my team of choice (I was brought up a gooner as my dad has supported them since he was little) this had to be included somewhere in this post. So that’s my top 5 football shirts! Head on over to Broken Thoughts to see Tim’s favourite five! *As always, click on the images to see the source.